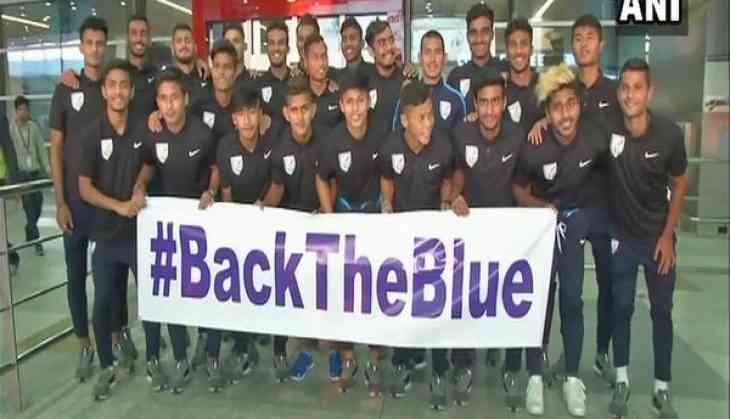 The Indian Under-20 men's football team that created history by beating Argentina in the COTIF Cup arrived at Indira Gandhi International (IGI) Airport here on Friday. The triumphant team was welcomed by emphatic fans waiting at the airport with placards bearing words of praise for the young men. Speaking to ANI, one of the footballers said the victory will help build up the team's momentum ahead of their next tournament. "When we went to Spain, our main aim was to gain more respect for Indian football the moment we came back to our land after winning the match. Now, a lot of people will notice Indian football," he said. The Indian team defeated Argentina 2-1 in their final match of the COTIF Cup in Spain on August 6. Deepak Tangri scored for India in the fourth minute, before Aniket Jadhav was sent off in the second half. However, Anwar Ali's 68th minute feat put India 2-0 up against Argentina, considered to be the most successful team in U-20 World Cup history. Although Argentina scored in the 72nd minute and hit the crossbar in added time, it failed to break the Indian momentum as the visitors ended the tournament on a high note. The Indian Under-20 football team created history last night when they defeated Argentina, 2-1 in their final match of the Cotif Cup in Spain. The team will next head to Croatia for another tournament.